Sunday School Class, Pleasant Hill No. 2; photo courtesy of Treva Hood. 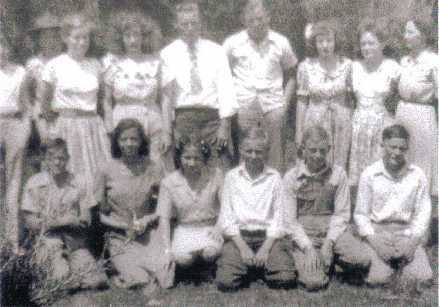 Top row, left to right: ?, ?, Doris Jones, Ethel Lee Lyle, Neal Glover, ?, Faye Jones, Vernice Collins (married Winford Watts), and Minnie Jones. Bottom row, left to right: ?, Johnnie Wright, Beverly Robins, Rex Ward?, ?, and James Martin?